Bike sharing pros talk about the cultural barriers that keep bike sharing exclusive. Shaquana Boykin knows exactly what that means – she’s lived it. 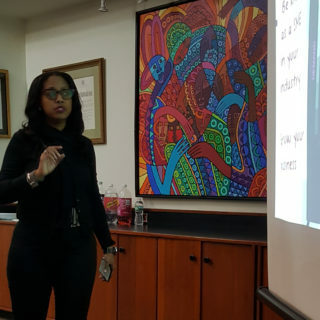 Boykin is the program manager for the Healthy Communities Initiative at the Myrtle Avenue Brooklyn Partnership (MARP), where her work centers on promoting healthy eating, physical activity and open spaces. 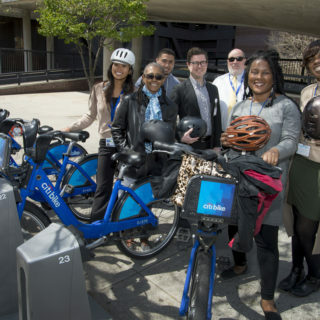 MARP has partnered with Bedford Stuyvesant Restoration Corporation to host monthly bike rides and encourage businesses to embrace bike share. Boykin is also an enthusiastic member of Citi Bike who qualified for a discounted annual rate because she is a resident of New York City Housing Authority (NYCHA). She spoke to the Better Bike Share Blog about how she became a bike share believer, the reservations her neighbors have, and what needs to happen to reduce those barriers. 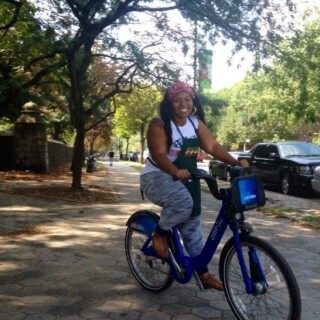 I was volunteering for my current organization and they did a bike ride with Citi Bike. I was like, what is this thing you’re on? I see it around. They explained it was Citi Bike and said it was like a regular bike. I got on and was, like, okay. I’d been on it but didn’t know anything else about it. It didn’t feel like it was for me. I didn’t know that I could just rent a bike. I thought you had to make a certain amount of money. Once I started working (at MARP) last year in July, they talked about Citi Bike and how you get discount membership for NYCHA. I was, like, what? They said, “It’s on the (kiosk)!” I went to station and only then saw the little sticker. It wasn’t obvious. SB: Being in the city and living in downtown Brooklyn, it’s easier and faster for me to bike to a meeting or to Target to get a couple things than waiting for the bus. Also, I’m full time at work and full time at school. It’s quicker to get from work to college (using bike share). I’m not spending money on transportation. Before, I would have to take a cab or wait for a bus and leave work an hour early just to go what is a seven to 10 minute bike ride. It’s just made my life so much easier. SB: I didn’t bike at all. When we were having conversations with (Bedford Stuyvesant Restoration Corporation) about bike share, my question was, people bike in the city? My executive director talked about research about helmet use and not using helmets and riding in the city. Having those conversations about biking in the city pushed me to the point where I said, ok, I’ll do it. In September, the building had a family day. I invited Citi Bike to come out. I told (residents) that I had keys they could do a ride. I learned what the reservations were. I went with them to the bike docks. Do you know how to remove a bike? Do you know how to get a bike? Do you know how to make sure you’re comfortable on the bike by adjusting the seat and gears? Just having all those conversations. The answer was “No.” (Citi Bike) just appeared one day and they didn’t know how to use it. I didn’t know it was for me. They didn’t even know the price. They thought it was way more (expensive). They were really shocked. They didn’t know about discount. They were pretty shocked that Citi Bike had an app. They just weren’t informed. They didn’t have the information. SB: I set my own example; I am always on a bike. I’m in their face. I’m the face. They see me on the bike and suddenly it’s not something that’s just for some people. 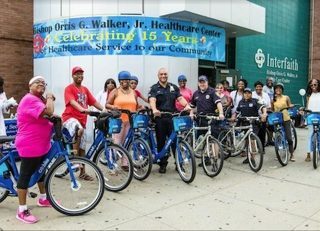 Anyone who is over 16 and can physically ride a bike can be on Citi Bike. One-on-one conversations can be good, but it’s not realistic. Are you going to get one person for every one person? The most valuable thing is having community partners who are able to do that legwork. We are in the community. We’re here to ask people, did you guys get your membership? SB: Citi Bike is awesome! I love Citi Bike. I get so passionate about it.